The Baton is a large pub in the Marshalswick area of St Albans, next to the Quadrant shops. It is good for watching sport as it has three plasma screens showing sport from Sky and other channels. The left side of the pub as you enter has two pool tables and a dartboard with the bar area located centrally. The main area of the pub has tables and chairs around a large chimney stack with a raised area at the back. There is a small patio area at the rear of the pub. Built in the 1960's The Baton underwent an extensive refurbishment in 2005 which resulted in a smarter interior. For the last couple of years The Baton has been part of the John Barras chain of pubs but recently (summer 2007) it appears that it is under new ownership. Two real ales are available; Green King IPA and Youngs Bitter. At the time of the visit the pub was reasonably busy with around thirty people other than our group. Most drinkers were in the mid-twenties to mid-forties age range and probably walked from the local houses/flats. Bar staff are friendly and efficient. Food is served all day until 8:30pm and often good value. Occasional live music on a Friday. Quiz nights on a Thursday. 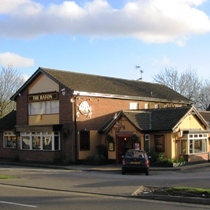 The Baton is a well run pub with a friendly atmosphere and comfortable seating that is fine for a drink/meal and watching sport. All three handpumps now serving Adnams Southwold Bitter.